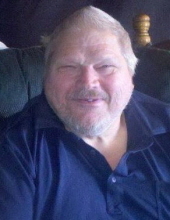 Age 67 of Corunna, passed away Monday April 8, 2019 at his home. A Memorial Service will be held Saturday April 20, 2019 at Caledonia Township Hall from 3pm to 5pm. Lee was the son of Raymond Edward and Bertha Beatrice (McConnell) Stroub born in Garden City, Michigan on July 18, 1951. He married Barbara Ann Yanik in Owosso on September 16, 2013. Lee loved being with his grandchildren, listening to old country music and watching the older sit-com TV shows. He also loved hunting and fishing and being outdoors. He was a member of the C.R.W. Lee was an avid NASCAR fan, his favorite driver being Dale Earnhart, Jr.
Lee worked at a dairy and later at F & E in Corunna. Lee is survived by his wife, Barbara; daughter, Amy (Allen) Cooper; son, Raymond Stoub; 5 grandchildren; sisters, Ruth (Phil) Newman, Linda (Glen) Loga; sister-in-law, Gail Stroub; brothers, Roger Stroub, Robert Stroub, William (Penny) Stroub; many nieces and nephews. He was preceded in death by his parents, Ray and Bertha Stroub; and brother, Dave Stroub. To send flowers or a remembrance gift to the family of Lee Gray Stroub, please visit our Tribute Store. Guaranteed delivery before Lee's celebration of life begins. "Email Address" would like to share the life celebration of Lee Gray Stroub. Click on the "link" to go to share a favorite memory or leave a condolence message for the family.